Canoa: A Shameful Memory is a political film that is not only defiant but defiantly odd. 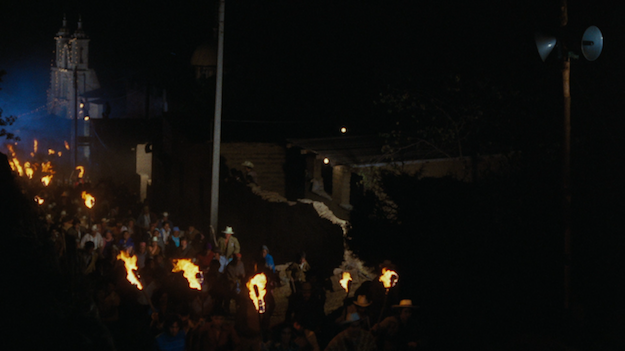 Released in 1976, and set eight years earlier, the film uses a hodgepodge of dramatic techniques to recreate one fateful night in the rural Mexican town of San Miguel Canoa. Spurred on by government propaganda and the misguided sermons of the local priest, a mob of paranoid locals lynched some visitors they believed were actually leftist subversives looking to attack the church and steal from the town. The attack is horrifying and ugly, and it turned out to be merely a prelude to the Tlateloco massacre a few short weeks later, where government troops killed hundreds of student protestors in the lead-up to the '68 Olympics. 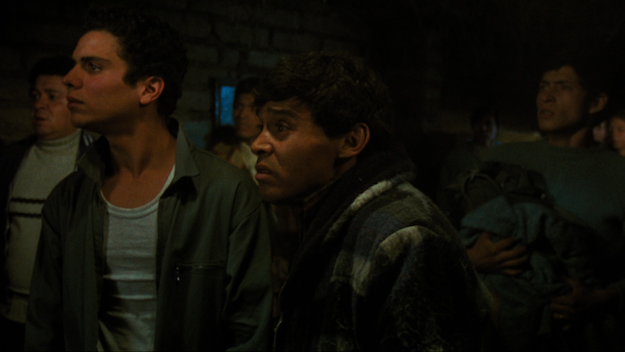 Tlateloco was still impossible to discuss in Mexican film in 1976, so it is suggested in the supplements of Criterion Collection's new Blu-ray release of Canoa that writer Tomás Pérez Turrent and director Felipe Cazals used the incident in San Miguel Canoa as a stand-in, a case study of the political tensions in Mexico at the time. The end result is not only provocative and infuriating, but it climaxes with an extended gut punch so visceral that it will burn into your brain for days afterward. The first scene of the film tells us exactly where this narrative is headed -- as a journalist coldly describes the grisly fate of our main characters at the hands of the pitiless mob -- but even this unflinching set-up cannot possibly prepare viewers for the impact of what is to come. For much of its running time, Canoa unfolds almost like a horror film in the vein of Cabin Fever. Our five main characters -- labeled flatly as "the victims" in an early chyron -- ignore rising political tensions in their area and foreboding weather reports in their quest to have a fun mountain-climbing trip. They're too brash, too loud, too wrapped up in their own little world to notice that all of the locals are constantly giving them side-eye. Their expedition is waylaid by a downpour of rain, but none of the locals want to offer them shelter. Finally, a fellow traveler offers his nearby relative's place to stay, and the five soon-to-be-victims think they are safe. Cazals restlessly fragments the thrust of his storytelling, by throwing in faux-documentary segments and fourth-wall-breaking direct addresses to the camera from a cynical local worker (played by Salvador Sánchez, who based his performance precisely upon recorded interviews with a real witness). Using these elements, Cazals draws a portrait of San Miguel Canoa's townsfolk as both undereducated and kept under the thumb of a shady local priest (Enrique Lucero). While the priest bilked the poor community out of their meager earnings (in the name of making improvements to the town), he also kept them fearful that outside rabble-rousers would inevitably be coming to steal the last thing they could hold on to: their religion. The film builds to the inevitable confrontation methodically. The townsfolk fill the streets with weapons and torches, as though they were hunting actual monsters. The outsiders listen with increasing concern to the growing noise outside and loudspeaker reports of "confirmed Communists" hiding who need to be captured. Their humble host assures them that it's nothing to get concerned about, but we know better. Before long, an angry farmer is slamming an axe into the flimsy door which was momentarily keeping the confused outsiders from the bloodthirsty mob outside. Cazals continually cuts away from the ensuing violence to other anachronous moments. At first, we might assume that he is sparing us the horror of seeing what exactly happens to these men, but actually he is extending the sequence and continuing to complicate the events we're seeing. 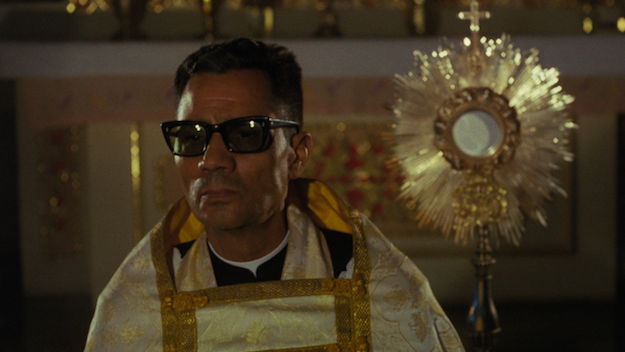 The most striking cutaway is a sermon by Enrique Lucero's priest, resplendent in his gangster sunglasses, telling his congregation that they must protect him from men who are coming to kill him. What makes Cazal's portrayal of the lynching so indelible is its brazenness and brutality. It's hard to imagine that, in a crowd of 2000 people, they would all support and cheer this inhumane treatment -- even if these men were guilty. And yet, that is what we see. The unusual rhythms and stylistic clashes of Canoa make it a challenging and not entirely satisfying experience for much of its running time. However, it becomes apparent by the end, that the film has carefully laid down the necessary foundation for its shocking and masterful coup de grâce. Canoa doesn't aspire to the finesse of something like Costa-Gavras's The Confession, but it similarly reveals the ugly machinations of a corrupt political system in ways that are harrowing and unforgettable. Canoa: A Shameful Memory is packaged with a fold-out booklet featuring an essay by Fernanda Solórzano. A typically first-rate presentation from Criterion. Sourced from a new 4K restoration, this AVC-encoded 1080p 1.85:1 transfer boasts excellent clarity and depth, even if the movie tends to have a naturalistic, unfussy aesthetic. Colors are extremely rich but well-balanced. Solid contrast and shadow detail delineation in the long night-time sections of the film. No noticeable damage or digital compression issues. Nicely restored but fairly simple (and similarly naturalistic) Spanish LPCM mono audio mix (with optional English subtitles). No score, but a little bit of diegetic music. Canoa, Forty Years Later: A Conversation Between Alfonso Cuarón and Felipe Cazals (HD, 54:41) - An outstanding supplement. This discussion between two generations of Mexican filmmakers is engrossing, informative, and quite entertaining. Cuarón guides the discussion nimbly and has a more fluid style than a typical interviewer. Also, while he knows a lot about Cazals' work, he gets surprised now and again by the older filmmaker's answers. One of the biggest surprises is the revelation that the real-life survivors of the Canoa incident were on set most of the time, talking to the actors throughout the recreation of this traumatic event. Cazals also offers this witty gem: "Mexican movies are full of songs. It's not about what they're singing, but rather that the song never ends. In Canoa, the song is broken off." Guillermo del Toro on Canoa: A Shameful Memory (HD, 3:30) - del Toro offers a brief intro to the film, largely discussing director Cazals' tricky feat of smuggling anti-government criticisms into a film partially funded by the Mexican government. Little known in this country, Canoa is a startling recreation of a real-life incident of mass psychosis. Like Costa-Gavras meets Cabin in the Woods, this is a postmodern political thriller that turns into an outright horror film. Highly Recommended.